Herbicide resistant (right) and susceptible (left) kochia after being sprayed. When Beckie & Reboud used a herbicide by itself just one time over a 4 year period, they observed a nearly 8-fold increase in resistant weed seed production. However, if they applied the same herbicide every year, but mixed it with another effective herbicide, resistant weed prevalence remained statistically the same as if they had never used the herbicide at all. A new study published earlier this year in the journal Pest Management Science lends additional evidence for the resistance management paradox. The goal of this new study from Illinois was to “identify risk factors associated with resistance.” Their work is pretty unique in the herbicide resistance literature because they used an epidemiological approach. They used a case-control design common in the medical literature to determine whether exposure to various factors was associated with development of herbicide resistance. For this study, the researchers used glyphosate-resistant common waterhemp as their model species, and obtained field management data for a few hundred crop fields over a 300 square mile area over an 8 year period. They evaluated 66 different environmental and landscape conditions and various management practices that were thought to potentially influence resistance development in some way. I think there are a few important takeaways from the Illinois research. First, rotation of herbicide modes of action simply isn’t enough to prevent (or, perhaps, even significantly delay) the appearance of herbicide resistance. Weed scientists and extension specialists need to be more clear about this in our education efforts. It seems that farmers in the Illinois study may have had a false sense of security from rotating herbicides, since they were actually more likely to develop herbicide resistant weeds compared to farmers who weren’t rotating. Rotating herbicides from year to year is only effective if it is also accompanied by other effective weed control measures. 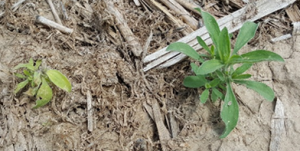 This research supports the potential value of stacked herbicide technologies like Enlist and Roundup Extend as tools for resistant weed management, since they will increase the likelihood that farmers will apply mixtures of effective herbicide modes of action. However, these technologies will be most beneficial only where resistance to glyphosate has not yet evolved. Where glyphosate-resistance is prevalent we will simply be selecting for weeds that are resistant to both herbicide modes of action in Enlist (2,4-D) or Extend (dicamba) systems. This is the “pesticide treadmill” that critics of the technology worry about, which is a valid, and serious, concern. For herbicide mixtures to be most effective, they must be initiated before herbicide resistance is a major problem. I still believe that to be true. Unless we plan on completely removing herbicides from modern agriculture (a laudable long-term goal, but unrealistic in the short-term), we need to try and protect the utility of the herbicides we have. Since herbicide rotations are ineffective on their own, the most practical way to maintain the value of current herbicides is to mix them with other effective herbicides. This will almost certainly increase the total amount of herbicides we use. But “spray more herbicides” is not something anyone wants to hear, including me. (Well, maybe some herbicide manufacturers.) Society wants us to decrease pesticide use. Farmers certainly don’t like spending money on more pesticides. So at some point, we must stop looking to herbicides as the solution to a problem created by herbicides. You know what they say about someone who keeps doing the same thing over and over again while expecting a different result. We need to place more emphasis on non-chemical weed management practices. This means taking some pages from agroecology and the organic weed management playbook. We need to make more regular use of cultural weed control practices like smother crops and stale seedbeds. We need to invest in more mechanical weed management technologies like robotics and seed destructors. Perhaps we’ll even have to reduce some of the benefits that have accrued from adoption of no-till production. I certainly don’t have a magical solution to the herbicide resistance problem. But I can guarantee that a long-term solution will not be simple, and it most certainly won’t be sold in a jug. UPDATE: if you’re interested in how easy it is to implement the multiple herbicide strategy on an actual farm, see this post.